Title: Gas composition of major volatile elements in protoplanetary discs and its implication for planet formation. Authors: A. Thiabaud, U. Marboeuf, Y. Alibert, I. Leya, K. Mezger. First Author’s Institution: Center for Space and Habitability, Universität Bern, CH-3012 Bern, Switzerland. Paper status: Accepted for publication in Astronomy & Astrophysics. Observations vs. Modeling: Interplay or Opposition? The recent discoveries of alien worlds seemingly rich in carbon reveal a lot of diverse information about the history and further evolutionary paths of exoplanets. However, a correct physical understanding of the investigated systems is crucial for getting the most out of incoming data and is an area of very active research. Therefore, the theoretical modeling of exoplanetary systems must be advanced to a state which includes the long-term evolution of the distribution of detectable molecular species in the planet forming environment. The Carbon-to-oxygen (henceforth C/O) ratio, or the relative amount of carbon to oxygen, is a quantity which tells us a lot about the chemical composition and can help to classify detected planets. Low C/O ratios support oxygen-rich species (for example water vapor, which might be important for habitability), whereas high C/O ratios favor gases depleted in oxygen, e.g., methane. The C/O ratio was already featured in this astrobite, which is based on a similar study using a different model. Figure 1: C/O ratio distribution for the solid (dashed line) and gaseous (continous line) material in a “typical” protoplanetary disk in comparison with the solar abundances (dotted line). The ice lines, where a specific material freezes/condenses, for three important compounds are indicated with their names. Source: Öberg et al. (2011). Today’s highlighted study is built on a so-called 1+1D planet formation model. This means, the protoplanetary disk is resolved in one dimension in radius and in one dimension for disk height. The model was developed earlier and with this paper it was expanded by adding the chemical composition and drift (movement in time) of the gas in the disk. Overall it includes several physically important effects, which may alter the distribution of the C/O ratio in space (i.e., close or far-away from the star) and in time in comparison with the host star. The reasoning by building such a model is that the C/O ratio of planets is determined by the place (see Figure 1) and time of their formation. Close to the star it is very hot and thus planets in this region must be built mostly from refractory species, which condense already at high temperatures. Planets farther away from the star can include volatiles, which have lower condensation temperatures. The time dependence means that the disk material is initially very hot and cools down gradually, forming a sequence of condensing materials, starting from refractory to volatile. Both effects also have to be combined with chemical reactions, which form new compounds and complicate the picture even further. 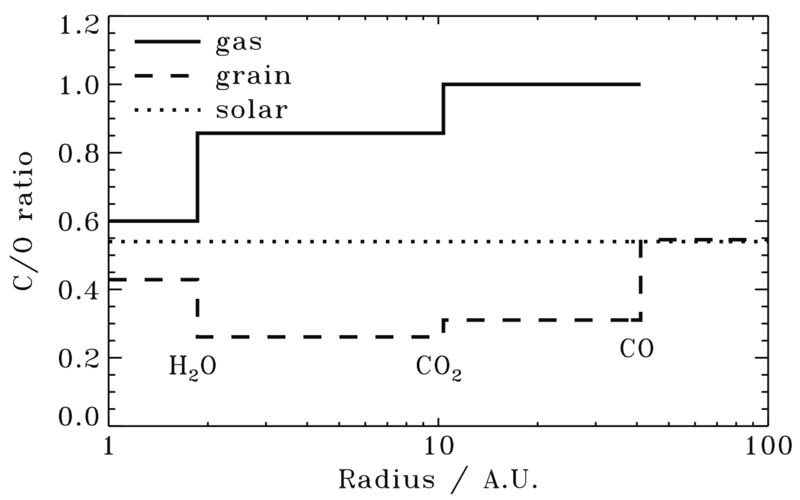 Figure 2: Relative amount of carbon to oxygen in the gas component of the disk for different formation times of the two embedded planets at the locations indicated with vertical lines. Depending on the formation time the C/O ratio distribution changes due to the evolution of the ice lines of the major chemical species. Source: Thiabaud et al. (2014). The most important feature of this work is the inclusion of possible accretion from an evolving gas disk with the major chemical species. This means, that forming planets in the system interact with the disk, which itself is evolving in time. Figure 2 shows the C/O ratio in the gas disk with two newly forming planets for different formation times (after the birth of the whole system). We see that the distance to the host star and the age of the system at the time of the formation of the two planets massively changes the evolutionary paths of the C/O distribution. Additionally, for the planets itself it is of major importance where they started to form (which determines their initial C/O ratio) and their migration history, i.e., the change in distance to the star and hence the interaction with different regimes of species in the disk. The aforementioned evolution of the gas phase, and so the temporal evolution of the chemical species and ratios during the disk’s lifetime, is a major ingredient. Without this effect only a few planets in the calculations end up with a C/O ratio intrinsically different from the host star (which would be expected in the classical theory, since both star and planet form from the same material). With the inclusion of gas phase evolution, many more planets end up with a higher C/O ratio. 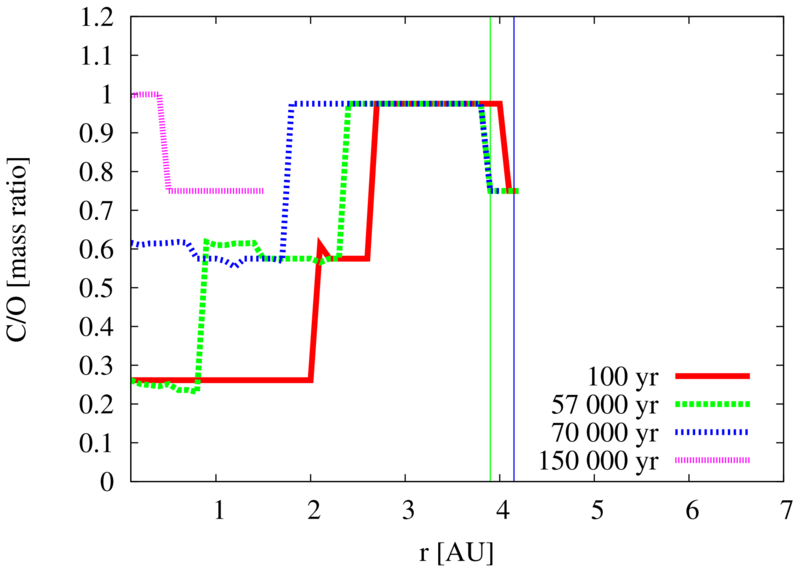 Additionally, the migration paths of the planets play a role especially for planets initially formed between 0.4 and 1 AU away from the star (this is the distance for the most crucial ice lines). And finally the authors find the irradiation of the star important for altering the position of the ice lines. Including irradiation means a steeper temperature profile and therefore the chemical species condense farther away from the star, which results in depletion of volatiles in the planets formed in the inner parts of the disk. Figure 3: C/O mass ratio following the planet population synthesis study. C/O ratio is indicated with colors from dark (low) to light (high). The left column shows computer runs with irradiation, the right column without irradiation. Comparing subplot b/f with a/e and d/h yields the conclusion, that the contribution of the gas is negligible to the planets overall ratio. Source: Thiabaud et al. (2014). Are Observational Conclusions Based on Wrong Premises? 1) The gas accreted by planets can increase the C/O ratio in the planetary atmosphere by 3 to 4 times (subplots d and h). This means that the model is able to reproduce planets with a strong C/O enrichment in the atmosphere compared to the host star value. 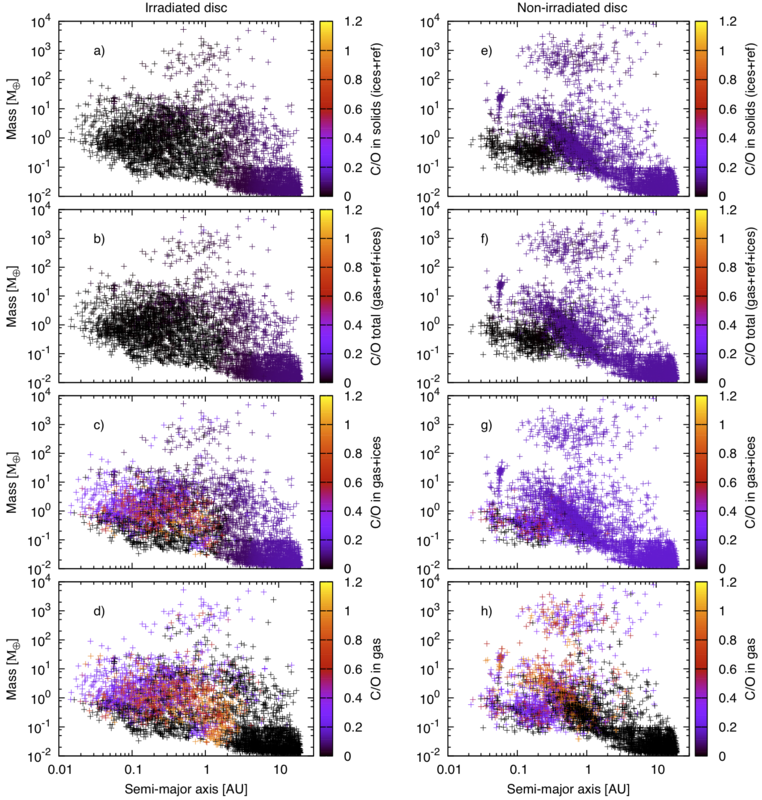 2) If ices in the planetary body are allowed to sublimate (subplots c/g vs. d/h) they dominate the overall composition of the atmosphere in comparison with gas accretion effects. This is mostly important in the models without stellar irradiation and far away from the star, since in the regimes close to the star ices are depleted. 3) Comparing the influence of solids and gas to the overall composition of the C/O ratio the gas is nearly completely negligible! (Compare subplots b/f to a/e and d/h.) This is very important for studies which try to conclude the atmospheric structure from observed line profiles. In specific cases, where high C/O ratios were measured, this could mean two things: a) There is no or negligible material exchange between the core of the planet and its atmosphere (and hence negligible ice sublimation and gas condensation). b) The observations are biased towards atmospheric layers enriched in carbon. The latter places strong constraints on observational conclusions and therefore must be considered in further observational studies!